Soothe and replenish wanting skin with the Dear, Klairs Rich Moist Soothing Tencel Sheet Mask, a moisturising face mask made from thin gauze with 100% cotton and tencel fabric to minimise irritation. 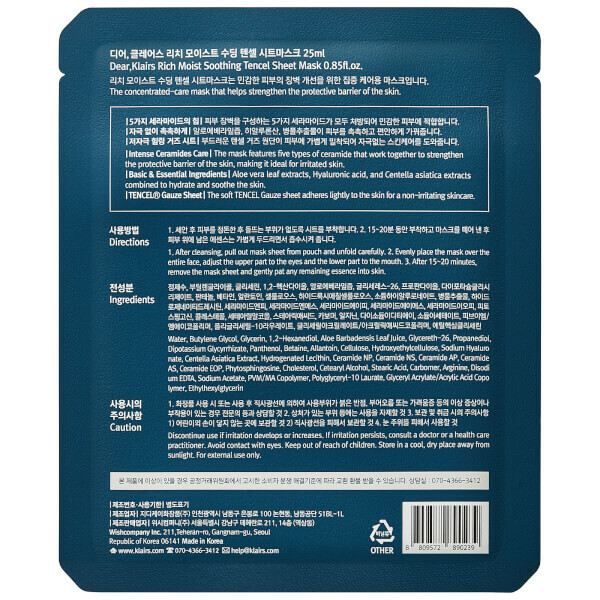 The sheet mask adheres comfortably to the face and continuously delivers its cocktail of soothing, moisturising and reparative ingredients. Containing five types of Ceramide, plus moisturising Aloe Vera, Panthenol, Hyaluronic Acid, the gauze mask will effectively soothe and relieve signs of sensitive, irritated skin while strengthening weakened skin barriers. Suitable for all skin types but particularly beneficial for skin experiencing dryness, redness and irritation. Made in Korea. No animal testing. Free from alcohol, parabens, colourants and artificial fragrances. After cleansing, place the sheet mask on a clean and toned face. Wait 15-20 minutes, and gently remove the mask. Tap the essence lightly into the skin for it to fully absorb. Water, Butylene Glycol, Glycerin, 1,2-Hexanediol, Aloe Barbadensis Leaf Juice, Glycereth-26, Propanediol, Dipotassium Glycyrrhizate, Panthenol, Betaine, Allantoin, Cellulose, Hydroxyethyl Cellulose, Sodium Hyaluronate,Centella Asiatica Extract, Hydrogenated Lecithin, Ceramide NP, Ceramide NS, Ceramide AP, Ceramide AS, Ceramide EOP, Phytosphingosine, Cholesterol, Cetearyl Alcohol, Stearic Acid, Carbomer, Arginine, Disodium EDTA, Sodium Acetate, PVM/MA Copolymer, Polyglyceryl-10 Laurate, Glyceryl Acrylate/ Acrylic Acid Copolymer, Ethylhexylglycerin.